A planet only 20 million years old and still hot from its creation has been photographed in a solar system 96 light-years from Earth. 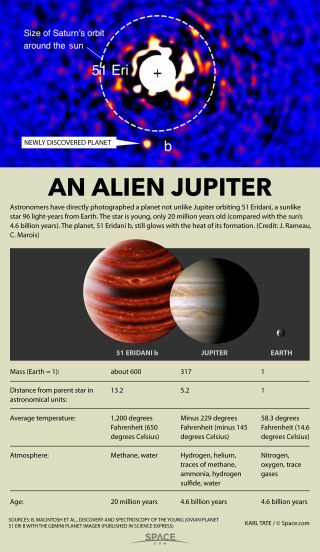 Astronomers have directly photographed a planet not unlike Jupiter orbiting 51 Eridani, a sunlike star 96 light-years from Earth. The star is young, only 20 million years old (compared with the sun's 4.6 billion years). The planet, 51 Eridani b, still glows with the heat of its formation. Scientists used the Gemini Planet Imager, an instrument on the Gemini South telescope in Chile, to make the discovery. The Gemini Planet Imager is an instrument designed specifically for directly imaging exoplanets around distant stars.